Bought this the other day without even opening the box, such was my confidence. I was wrong to do that. First impression is that it feels cheap compared to older MXR pedals I own. It is light, lacking the solid feel I associate with the brand. The knobs feel cheap when you turn them compared to their earlier products. The first time I plugged it in the input volume display at the top of the pedal didn't work at all. Before returning the pedal the next day I tried it again and the display worked. I lack confidence in this pedal. very disappointed, especially for the money. I got this little monster about a week ago, I did not know very much about compressors, but I sat and watched hours and hours of videos teaching me how to use it. It have revolutionized my sound, everyone says every bass player should use one of these and I now agree. I use a marshall 8x10 stack because i prefer a punchy tight sound. This thing made my rig sound way better... If you are like me and did not know much about compressors... GET THIS ONE! Spend a bit more and you won't be disappointed. This works well with an amp or direct for recording. Very nice tone - smooth and even. I have been using this pedal now for 6 months and cannot play without it. It gives you a bigger sound than when bypassed. The key is to set up the input level and that is easy with the LED readout. With the other controls at mid it works great for all types of styles, from funk to jazz. I had a Boss Bass Limiter/Enhancer but it wasn't doing the trick anymore. Couldn't decide if I wanted this or the Diamond. Went with this for a few reasons. 1. Smaller, 2 Controls, 3. The Gain Reduction Meter. 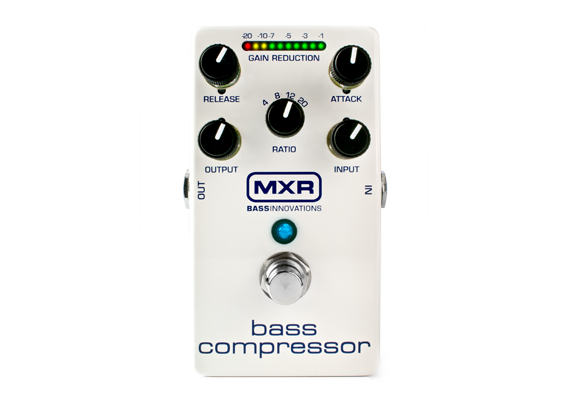 This is everything you want in a bass compressor and in a tiny package. I purchased the Boss LMB-3 which I thought was a fine pedal but I was having sound issues. After some trial and errors I blamed that Limiter (the jury is still out) and ordered the MXR M87. After playing with this compressor, the transparency of this unit was readily apparent. Easy to get a great sound and my basses sound like my basses. Easily worth the extra $100 from the Boss pedal. As the previous reviewer stated, this pedal is very transparent! Lots of possibilities configuration wise, a bit on the expensive side, but well worth the purchase. I'm very happy with it! I use a rackmount DBX 160A as part of my gear. It does a great job. But I needed a pedal that would be just as transparent without adding "colour" to my tone. Well, the MXR bass compressor was the answer. I do not like gear that adds colour and tone to my sound as I like to rely on my fingers and my instrument to get the sound that I want. 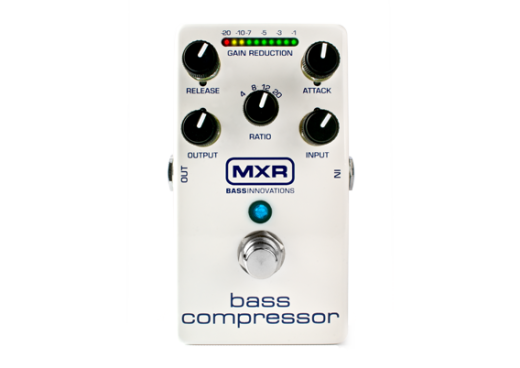 The MXR compressor is the perfect choice if you have to use gear that is provided by the gig and you want something that you can rely on to get the job done. I absolutely recommend this pedal to all gigging bass players.